During my prayer time last week I saw a United States battleship firing its cannons similar to what is shown in this photo. Seeing that reminded me of another vision I had two years ago. In that vision I saw a black cloud that looked like it was made out of black rubber. Then the cloud transformed into the shape of a black battleship, which I somehow knew belonged to the United States. Then the scene changed and I saw the bare back of a man standing in front of me. He was so thin I could see all of his ribs. As I watched the man turned into a skeleton. I understood this to mean war, famine, and death were coming to America. This vision parallels the breaking of the first four seals in Revelation 6:1-8. When the first seal is broken the rider on the white horse receives a crown, which is the antichrist. This is the black cloud, which is a fitting symbol because the presence of the antichrist brings great trouble upon the earth. When the second seal is broken the rider on the red horse removes peace from the earth. This is the U.S. battleship. When the third seal is broken the rider on the black horse brings famine. This is the bare back of the man with his ribs showing. When the fourth seal is broken the rider on the green horse releases death. This is the skeleton. The black cloud has already arrived. The rider on the white horse received his crown in 2008 with the election of the antichrist, Barack Obama. Trouble started as soon as he showed up and has continued ever since. More trouble is coming soon as the world has now entered into the birth pangs that Jesus warned us about (Matthew 24:8). I believe a naval conflict is coming because I have now seen two visions of the U.S. battleship. It might begin as a smaller scale regional conflict, but I believe it will eventually grow into a major world war because the rider on the red horse is already riding to remove peace from the earth. I was not shown the timing or where the conflict would happen, but a potential conflict is already escalating in the South China Sea. 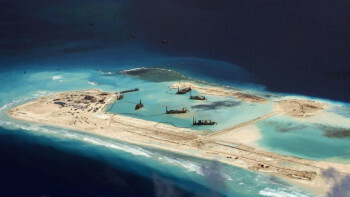 Although it is considered International waters, China has been laying claim to it by creating new islands from coral reefs then converting them into landing strips for their airplanes. The United States foolishly provoked them by flying a spy plane over the reefs and then making a public statement vowing to continue sending more air and sea patrols into these waters. China responded with the following warning from Foreign Ministry spokesman Hong Lei. On Monday May 25 a Chinese state-owned newspaper made an ominous warning of what will happen unless Washington stops demanding Beijing halt the building of artificial islands. In my previous post, Warning: Sudden Economic Collapse Coming in 2015, I shared how the Lord showed me in a dream an economic collapse would happen this year at a time when there are increased tensions between nations and between Americans. In that dream, I also saw China threatening to declare war against the United States. I did not see them actually declare war, but I saw them threatening to. Now we are seeing tensions increasing and China making threats of war. I believe we are getting close to the big event. Brother I am from the Philippines. And I am indeed a Filipino Catholic who only worship God but our new leader would sacrifice himself to avoid bloodshed and he is willing to give up those islands that China claimed. As a Filipino Catholic I am indeed proud of being a Catholic but not all Catholics praise Mary. So far this year 2016 I thought the intercessory prayer was all about God instead it was all about Mary. They are still continue praying to Mary because she is Jesus mother since his birth. My country Philippines receive a prophecy from an Indian Prophet who is Evangelical. He told us to unite with all the churches here in the Philippines so we could not be hit by a possible tsunami and it happen, the tsunami didn’t entered the Philippines instead it was pull back. The Indian Prophet’s name is “Sadhu Sundar Selvaraj”. Our pastor said it well last week. We should be focused on the eternal lives of those around us. Not the trouble of the day. Matthew The key word there is WORRY. He doesn’t say to do nothing…….The birds don’t worry BUT they still seek food, shelter, and safety. It’s all in the attitude. Be the attitude of love, praise, and thanksgiving WHILE going about your daily chores……. Then you fulfill Psalms 91 while acting in faith. The Lord gives warnings to His people to let us know about trouble coming so we can prepare and pray and share the warnings with others. That does not mean the Lord is worrying about it by telling us and it does not mean we are worrying about it by telling others. He says He does nothing without first telling His secrets to His prophets (Amos 3:7). Excellent word! Do you mind if I post it listing you as the author? No, that is not what he showed me. I have posted my own revelations along with those of other people in the Antichrist section, which is linked in the top menu. Seek the Lord regarding this and do not lean on your own understanding. He will show you the same way he has shown many others. Obama is the antichrist. The Russian strike will include the use of nuclear weapons on select targets. Thanks Mike! I did not know that, but I can see how it could happen that way. Thank you Mick. I am glad that someone has finally put this into perspective. Yes, there are many anti Christs in the world today, and yes, Obama appears to be one of them. He is not, however, “the” antichrist. The true anti Christ will not be revealed until until the middle of the finale seven year period when he stands in new temple in Jerusalem declaring himself to be God. The abomination of desolation. His identity will be revealed to everyone at the abomination of desolation. For those who have ears to hear, his identity is being revealed now. I live in the Philippines. this south china sea issue is silly. It is not USA territory, nor is Phlippines USA territory–it is not our fight, our business nor our responsibility. No one cared about south china sea until oil/minerals discovered. Now Philippines wants USA mothers to give up their sons to die for their greed . while their sons lay around all day and Americans take all the risk and burden There is no upside for America on this issue–what does USA have to gain from it? Nothing!. It’s not our fight, our territory nor our responsibility. I also frequently travel to China– this was never a big issue to them but to save face now–not to back down to threats–this could escalate–very poor and amateurish diplomacy played by America–and I’m American. I believe the bankers are trying to intimidate China by threatening them with war. It is a vain attempt to preserve their dollar empire, but it is doomed to fail. I don’t believe for one minute that Obama is the anti-christ, and I’ve heard all the evidence. He’s a forerunner, to set the stage, but he’s not the one. The anti-christ will be far greater than Obama, who’s being made to look like a child and buffoon in comparison to Putin. This is of course theater, but it should cause doubt in the minds of those who think Obama is the anti-christ. Do you really believe the anti-christ will allow himself to be shown up by a mere man? The world will worship him, he will be as a god, so much so that even world leaders will bow to him. Obama doesn’t have anywhere near that kind of power or respect. There will be a second Civil War as Christian patriots who’ve had it up to her re-boot the south and secede from the hijacked USA. The US Navy will fend off any attempt by foreign / UN scum of interfering. Most likely any “other” attempted invasion will come up from the Mexican border. I reckon we should PREPARE AND PASS OUT FLYERS INFORMING EVERYONE WE CAN REAL QUICK LIKE !! !